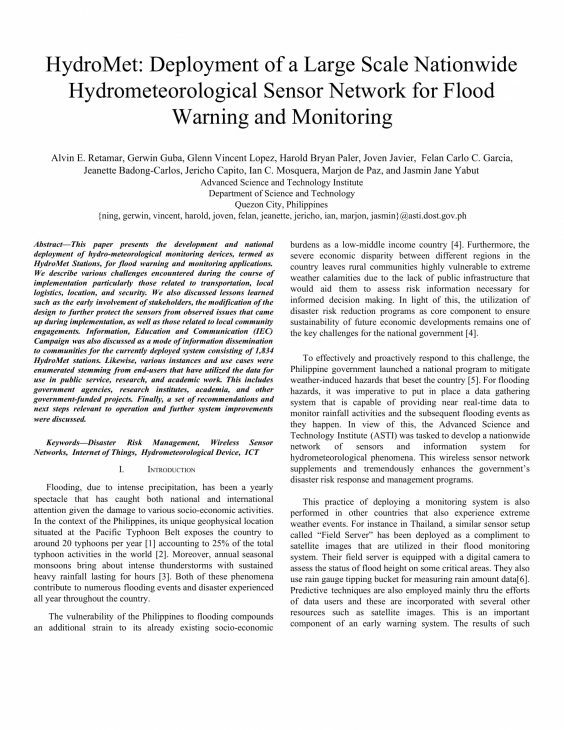 This paper presents the development and national deployment of hydro-meteorological monitoring devices, termed as HydroMet Stations, for flood warning and monitoring applications. We describe various challenges encountered during the course of implementation particularly those related to transportation, local logistics, location, and security. We also discussed lessons learned such as the early involvement of stakeholders, the modification of the design to further protect the sensors from observed issues that came up during implementation, as well as those related to local community engagements. Information, Education and Communication (IEC) Campaign was also discussed as a mode of information dissemination to communities for the currently deployed system consisting of 1,834 HydroMet stations. Likewise, various instances and use cases were enumerated stemming from end-users that have utilized the data for use in public service, research, and academic work. This includes government agencies, research institutes, academia, and other government-funded projects. Finally, a set of recommendations and next steps relevant to operation and further system improvements were discussed. The Embedded Systems Group (ESG) was formed as an initial test bed of the agency to accommodate the increasing demand for dynamic software and embedded hardware designs. The group is now responsible for developing holistic embedded solutions for clients that incorporate microcontroller-based design, communication, graphical user interface, and applications. Composed of 17 staff with skills ranging from hardware and software engineering, information technology, and research among others, ESG had produced notable products and solutions like the arQ (Advance Remote Data Acquisition) Unit, various weather stations with field implementation and deployment, Printed Circuit Board (PCB) Design, Development and/or Fabrication, and prototype building. The group is also currently active with the “Development of Extreme Weather and Information Sharing System in the Philippines” or ULAT Project.